"Thornwell Orphanage, planned and made by Willis Osborn, is a film study of Thornwell Orphanage, showing the scholastic, industrial and religious training of the youngsters there and presenting a subtle argument for its support. This is a difficult subject because of the problem of selecting significant and coherent action from among the almost endless possibilities. Most welfare films are too discursive and too general in treatment to secure the effect desired. Mr. Osborn has succeeded in avoiding this and has produced a film as coherent and informative as it is well photographed." Movie Makers, Dec. 1932, 560. "The six reel film, Technical Methods in Cancer Research, produced by Francis Carter Wood, jr., ACL, for the American Journal of Cancer, is the most distinguished and thoroughgoing scientific picture viewed this year in League headquarters. In it Mr. Wood, working in collaboration with his father, editor of the Journal, has presented in detail the many processes evolved and used at Crocker Institute of Columbia University in the treatment and study of cancer. Difficult details of clinical analysis are shown clearly with accurate lighting and unfailing definition. Laboratory bench work on specimen growths is supplemented by microscopic studies of corresponding cells. One entire reel is devoted to a unique stop motion study of leading cancer cells in living motion. Throughout the film Mr. Wood's camera treatment, editing and titling are polished and forceful." Movie Makers, Dec. 1932, 560. "Canadian Capers, filmed by Hamilton H. Jones, ACL, is a superlatively good vacation picture, complete in every important detail and containing several magnificent examples of sequencing. Among these is a satisfying study of a railway train. Mr. Jones neglected none of the cinematically interesting views that are unique to this subject and included several, such as scenes inside the engine cab, that ordinarily could not be secured. This picture has the important quality of conveying to the audience the maker's enthusiasm for the subjects filmed." Movie Makers, Dec. 1932, 560. "The seven reel industrial film made by Sherman A. MacGregory, ACL, of the construction of a sewage treatment plant was placed among the year's ten best because of its exact and thorough handling of a difficult subject. For more than five months Mr. MacGregory served as construction engineer and cameraman on a job that progressed slowly through many stages. But only by recording in detail all of these stages could he make the film serve its purpose efficiently as an office record — with the result that 4000 feet of 16mm. 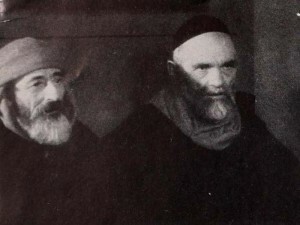 film were exposed in the process. In the final, carefully edited and titled edition, Mr. MacGregory has achieved and sustained definite interest, even for the layman, in a film subject that threatened monotony at every turn. Unusual and effective camera positions played a large part in this as a complement to the exact production and editing." Movie Makers, Dec. 1932, 560. "Garden Closeups, by W. T. McCarthy, ACL, demonstrates its right to be placed among the ten best films because of the painstaking care and time expended in its preparation and because of the exceptional results achieved. The film covers a subject which is almost entirely in miniature, but which, in its motion picture interpretation, reveals a whole new world which only the eye of a discriminating filmer and a nature lover could catch. Here are excellent closeups of the common varieties of garden flower, pictured so skillfully that the technique used is forgotten and the actual, living flower seems revealed on the screen, sometimes swaying gently in the breeze, sometimes rifled by a gigantic bumblebee pictured in alarming closeup. Another sequence will show the honeycombed intricacies of a wasp's nest, a time condensation technique showing its gradual cessation of activity as the winter comes on. An outstanding achievement in closeup technique showed the praying mantis in the very unprayerful act of devouring its victim. 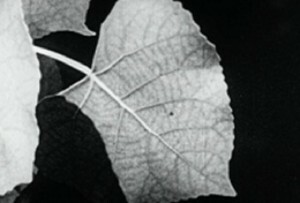 The film was made almost entirely with the aid of a telephoto lens with special extension, which enabled the patient cameraman to capture his flower and insect subjects from a moderate distance. Focus and exposure alike show the result of painstaking care in Garden Closeups." Movie Makers, Dec. 1932, 560. "Studies in Blue and Chartres Cathedral, a cerulean cinema achievement, one 400 foot reel in full Kodacolor by John V. Hansen, ACL, shows what an artist's and a colorist's eye can select and record. 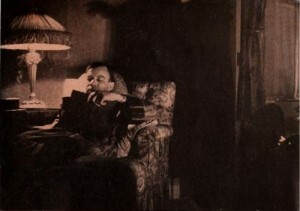 While this film is in some sense a travel record, Mr. Hansen definitely made it a point to choose those scenes and vistas that revealed the open sky, whether seen in patches through the interlaced branches of trees or as a dim, distance haze, shimmering up from the tops of far off mountains. Here are deep blue skies overhead, merging into white mist at the horizon, apple green, azure, so many hues that it is a revelation to see that a mechanical process can so beautifully record nature. Mr. Hansen presents to the audience's eyes such a varying kaleidoscope of blending colors in his continuity that it is difficult to do the entire effect justice by mere description. But among his outstanding technical achievements are the recording of sunlit glades in a dense forest, especially effective cloud and sunset shots, distant and close shots and side lighting and backlighting in profusion. A further, outstanding triumph in color technique was shown in Mr. Hansen's recording of the vivid, glowing hues of the stained glass windows, taken from the interior of the cathedral at Chartres. 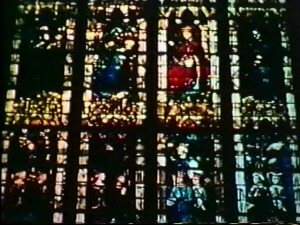 Here, he succeeded in capturing that peculiar, deep dyed transparency found only in the colors of old stained glass. It is questionable if any other method of reproducing color can give such a real and beautiful rendition of stained windows as the motion picture. Certainly no color printing process can compete. The film was rounded out by some charming long shots of the carefully cultivated, rolling hills of Denmark." Movie Makers, Dec. 1932, 538, 560. "Two Minutes to Play, running two reels, 16mm., and a production of the Greenbrier Amateur Movie Club under the direction of Hal Morey, ACL, stands out among the year's films because of its unusually deft cutting and shrewd camera treatment. Although plotted on the standard football yarn, the picture tells its story swiftly, smoothly and with a rising tempo of excitement that is a direct tribute to the production and to the editing. Consistently good photography, effective and varied camera angles and a well planned script were contributing factors in the success of this genuinely entertaining film story." Movie Makers, Dec. 1932, 538. "Lot, two reels 35mm., produced by Dr. James S. Watson, jr., ACL, and Melville Webber, may be said to be as much of an advance in motion picture technique over Fall of the House of Usher, their earlier production, as that film was an advance over standard professional cinematography. There are very few cinematographers in the world who have devoted the whole of their efforts to experimentation with the motion picture as an art medium and, in the opinion of Movie Makers' staff, there is none who has achieved the signal results of these two. Lot represents a complete innovation, not only in the treatment of the theme as a whole, but in the cinematic interpretation of the sequences. In it, the familiar tools of the advanced cinematographer, multiple exposure, trick printing, complicated lighting, symbolism, models and models in combination with life size sets are used to secure an entirely new and very beautiful cinematic representation of the Biblical story. In Lot these two amateurs have mastered the world of illusion of the motion picture but, in doing so, they have produced more than a mere novelty; they have founded a new cinematic art." Movie Makers, Dec. 1932, 538. "Portrait of a Young Man, by Henwar Rodakiewicz, ACL, is a triumph of fine photography and sensitive imagination. Abstract in treatment, and speaking through delicately rhythmed scenes of smoke, leaves, grasses, the sea, machinery and the heavens, this film is an attempt to portray in graphic terms a young man's reactions to the beauty, force and mystery of the natural world. In producing the final three reel version, Mr. Rodakiewicz has filmed deliberately toward the one end for more than three years and in many different locales. Although using largely material to be found in nature, he has so transmuted it, by the creative artistry of his selection and control, as to get from each selected scene, not a mere reproduced likeness, but a trenchant and symbolic image. Portrait of a Young Man is beautiful, exciting, workmanlike and distinguished." Movie Makers, Dec. 1932, 538. "Among the ten best, The Last Entry, running seven reels 16mm., is one of the most ambitious amateur photoplays ever undertaken and completed. The plot, requiring many elaborate interior sets, is based on a mystery story that opens with a house party. While a room is darkened for the projection of amateur films, one of the guests is murdered and all present may be suspected equally. The detective handling the case uncovers the fact that the murdered man, an author, has lived on blackmail effected by threats of exposure through publication, which throws suspicion on several of the guests of the house party who were discovered to be his victims. However, in the end, the murder is solved by screening the same pictures that were on the projector when it was committed. Although this plot offered great difficulties in the direction of large group scenes, the creation of the necessary lighting effects and the interpretation of the actors' roles, it is beautifully and suavely handled. In the film are several lighting treatments that may be listed as among the most effective ever achieved by amateurs. One chase sequence staged through long corridors, a large, dimly lighted attic and on the roof of the mansion at night in the rain, can be likened only to the effects secured in the best professional mystery photoplays. 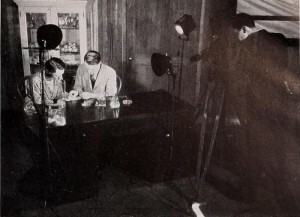 James F. Bell, jr., ACL, was director with Charles H. Bell, ACL, and Benjamin Bull, jr., ACL, cameramen and Lyman Howe, ACL, in charge of lighting." Movie Makers, Dec. 1932, 537-538.